// Oxygen Bars: Taking a Breath of Fresh Air Too Far? Oxygen Bars: Taking a Breath of Fresh Air Too Far? What are oxygen bars? These days, the term “belly up to the bar” has taken on an entirely new meaning! With the advent of the oxygen bar, oxygen enthusiasts from around the world can pull up their barstools, rest their elbows on the counter and order a shot – of oxygen that is! It’s true; for about $1 per minute, virtually anyone can inhale 40% oxygen through a thin, plastic tube for up to 30 minutes at a time. Some establishments even offer monthly memberships and a choice of fragrance. 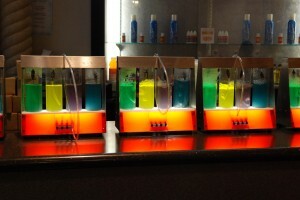 What are the advantages of inhaling oxygen at an oxygen bar? Proponents say that it boosts energy, relieves stress, increases concentration, improves the immune system, eases headaches and relieves hangovers – to name a few. From medical doctors to government health agencies, oxygen bars are under attack from a growing number of critics. The general consensus in the medical community is: there is no scientific proof that people with healthy lungs gain any real benefit from breathing oxygen at an oxygen bar. In fact, according to some medical professionals, using oxygen recreationally is just bad medicine. Oxygen Bars: Make Sense or Senseless? To gain a better understanding about the questionable practice of recreational oxygen one must only look at the biophysical facts behind oxygenation. Normal oxygen saturation is 95% to 100 percent. The air we breathe contains approximately 21% oxygen. For people with healthy lungs, the percentage of oxygen contained in the ambient air is enough to keep their blood almost completely saturated with oxygen and their oxygen saturation levels within normal limits (95%-100%). If the blood is already 95% to 100% saturated with oxygen, breathing more oxygen won’t make it any more saturated. Should People with Lung Disease Go to Oxygen Bars? 1 WebMD. The Rise of Oxygen Bars. 2002. 2 MedicineNet. Oxygen Bars: Is a Breath of Fresh Air Worth It? Last reviewed November 19, 2002. I would like some equipments for sale at China. If you have intersting, let me know and send email to me. Thank u!